April 2014 – "da Trooper Bali"
Hello all of my dear friends who visit this site. How are you..? Ten weeks, 15 February 2014. 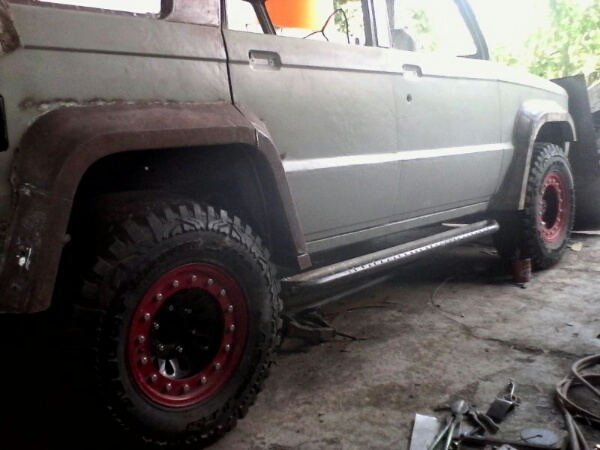 As usual post office hours, I drove my Freeca II Mitsubishi or in Indonesia well known as a Mitsubishi Kuda with 4D56 diesel engine to the workshop to see the progress of my babe da Trooper. I start from Nusa Dua by 14.35 Bali Time, but un fortunately the traffic a long the road from Jimbaran to Denpasar jam hold me too long on the road. Normally take abut 45 minute to Denpasar from Nusa Dua, but this time take almost 2 hour. Finally I arrive at workshop by 16.50 Bali time and the workshop ready to close. 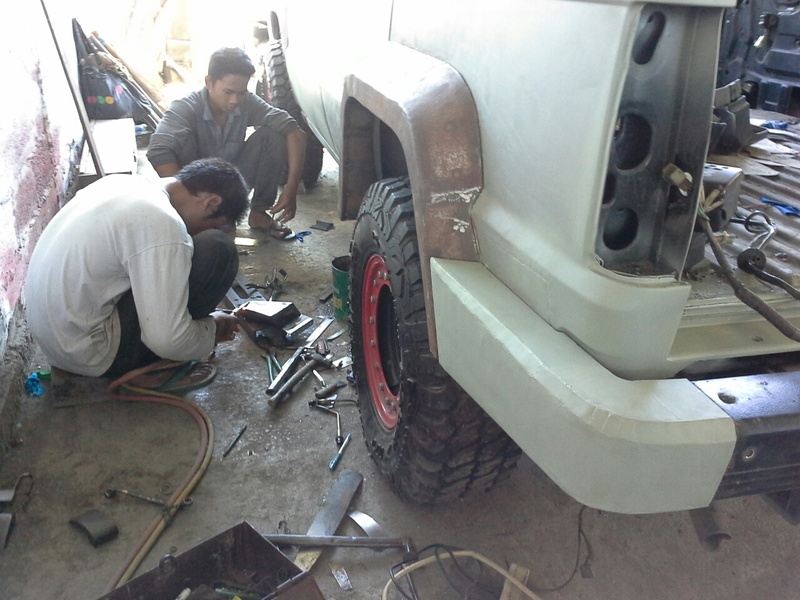 But as a loyal costumer, I can entry the workshop and just have a look my trooper. Seem not so many progress from last week. It’s only fitting the rear end and that’s it. But luckily, MR. Eko the mechanic still not went out. 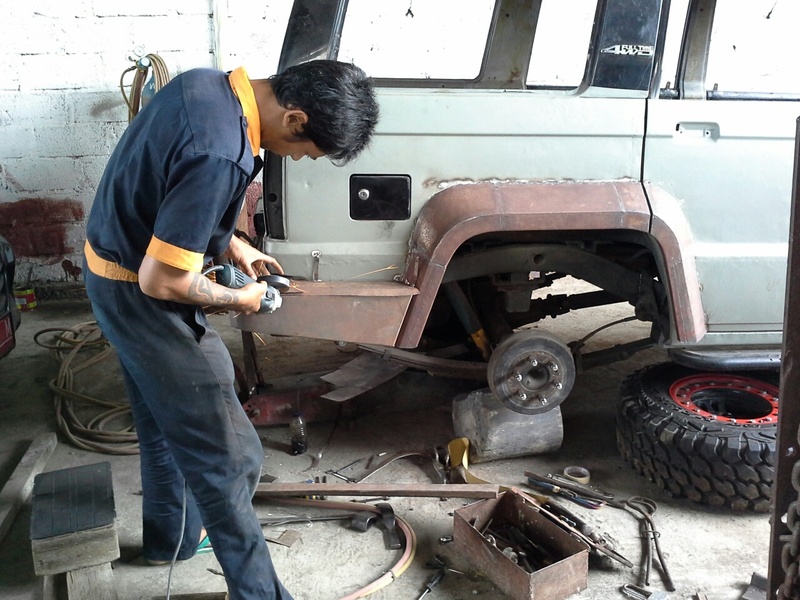 He greet me and said that he must fixing another car since the owner of the car will bring the car to Java. He apologize for the delaying. But I said never mind as I must understanding that he also must follow his boss direction after me. 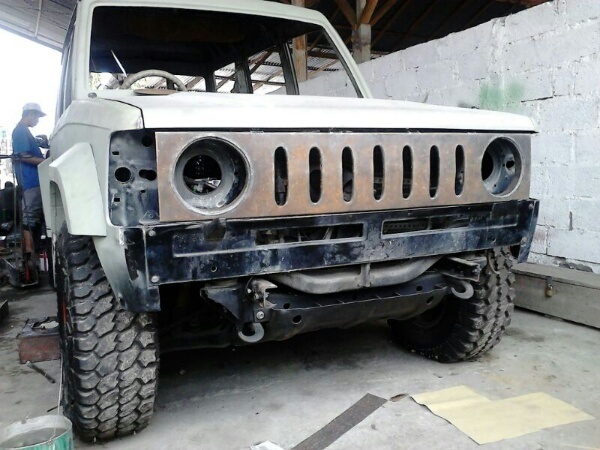 We discuss about the rear end and the fender and also the remake of the footstep. Use the previous foot step, but must modify a little bit to make it match and harmonize with the front fender and the rear end of the vehicle. Eleven weeks, 22 February 2014. By 12.15 I’ve been on the way to the workshop as I bit early home from the office as I take a permit to home earlier than usually. So I am arrive at the workshop by 13.20 Bali time and go straight away to the hangar of the welded to see the develop of the project. I realized that the front fender and the rear end almost finish, but Mr. Eko still check the detail of the harmonization of the body kit in order to make it perfectly fit and good looking on the vehicle. 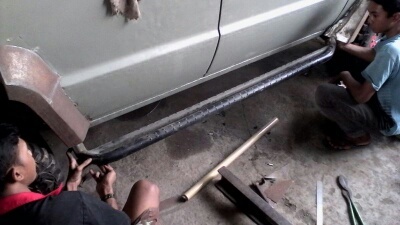 I watch the mechanic cutting the new plat to make the part of the fender. I enjoyed very much watching the mechanic doing the work. So I can observed how the part must cut down and how to fitting and remake the part of the fender. I back home by 17.15 Bali time as the workshop near to closed. Twelve week, 1 March 2014. 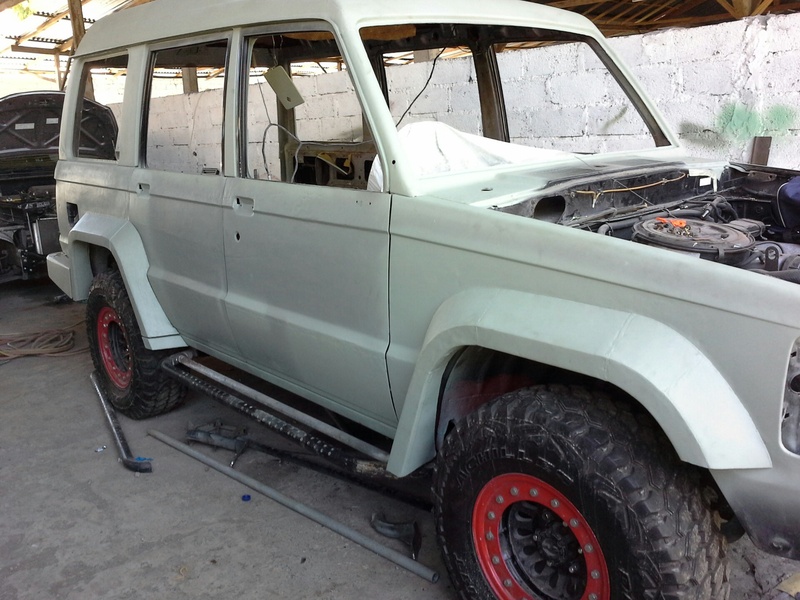 As usual I arrived in the workshop by 15.00 and inspect the development of the project and knowing that the fender now almost finish. But still fitting the foot step to make it proper and good looking when it bolt on the body of the da trooper. Need the good mood and patience to make the foot step in order to make the harmonize part overall. I must appreciate to Mr. Eko the technician for his effort to realized the body kit are fit and built properly on my da trooper. He many do a trail and error to realized what I wants and how it look on the da trooper, and if I think it is not perfect or not good looking, I ask him to put out and remake with another model or design. It’s really take time to build until met what I expected. But finally the foot step now fit on my da trooper. It make me happy. 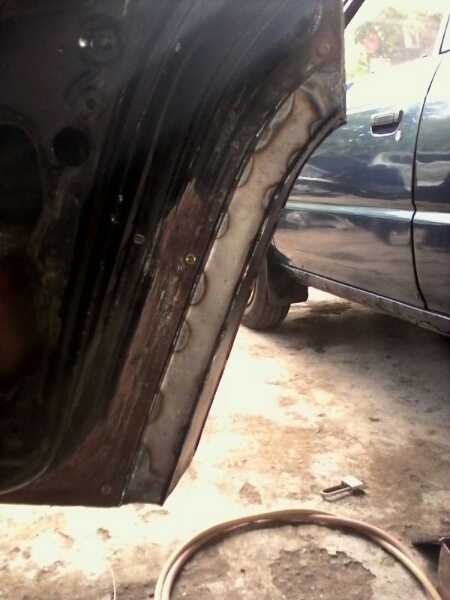 I inspect the project and realize that, foot step are fit and also the fender are now seem in connection with the footstep, but actually there is still a small things which not make me satisfied, but I could not think what is that. It is around the foot step and the front fender. But it’s Okay for the moment, as we must to continue to another part to make the progress move on. 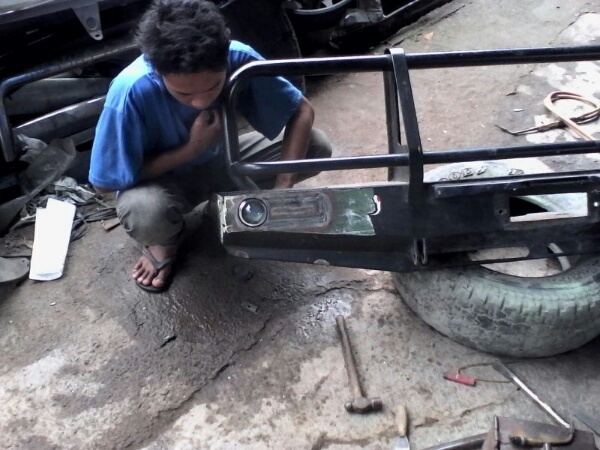 So the mechanic start with another work which is to modify the front bumper. Fourteen weeks, 15 March 2014. Now, the mechanic work with the front bumper as I need to modify a little bit, fitting the Xenon lamp ex All New CRV on the front bumper, remove the turn direction lamp and add the small direction lamp on the right and left side of the end bumper and add on wide of the bumper down about 2 inches and follows to ending in front face of the bumper. So it make the bumper seem more bigger and more tough. He he he. While the Xenon lamp ex All New CRV are now buried in the end of the front face in left and right of the front bumper. It use as a head lamp or fog lamp. It quiet difficult to fitting and build the house of the Xenon lamp as a very slim space for it position in the front bumper, but Mr. Eko success to made it. Sixteen weeks , 22 March 2014. This week I am not visit the workshop as I am away from the town to Yogyakarta to gathering with some of friends from Java and Bali which held in Grand Aston Jl. Urip Sumoharjo, Yogyakarta for three days. I miss the work of the project.